Is there a creativity crisis? Where have all the creative people gone? Or have they been under our noses all the time? Many highly sensitive people and high sensation seeking highly sensitive people identify as creative individuals. The eight signs of a creative person (listed below) would describe many HSPs and HSS/HSPs on an innate basis. It is interesting to note that this new book, by educational psychologist KH Kim, seems to describe HSPs and HSS/HSPs very well. Though there are certainly many other creative people in the overall population HSPs and HSS/HSPs may be more intrinsically oriented toward creative lives (in many manifestations) due to our “toolbox” being preloaded with the appropriate tools for creative thinking. The section on how to support creative people would also apply very well to HSPs and HSS/HSPs in the workplace and beyond. Both groups tend to require a high degree of autonomy, prefer open-minded and inclusive workplaces, and can benefit from a certain degree of structure (as supplied by a mentor for example). Uncontrolled or undirected autonomy may result in little but when we live within structures that have expectations we may be more likely to actually apply the fruits of our explorations to projects and problems. While I may question whether there is a creativity crisis I do believe there is much support for a lack of understanding or appreciation that exists in the workplace and beyond with regard to creative people (HSP and otherwise). The key, beyond offering autonomy, inclusiveness, and mentorship, lies in valuing creativity as a resource in our society that lies at the heart of all forward progress. Creativity is more than a means to an end (a unique new product or service designed to sell, sell, sell) it’s a way of life wherein the creative person must be free to understand and accept his or her own creative nature, which by definition is a difficult way of being. Until we can begin to accept that not all people are alike and make allowances for those with a different perspective, those who think and act differently, creativity will continue to be undervalued and misunderstood. Tracy Cooper, Ph.D. is the author of Thrive: The Highly Sensitive Person and Career, and Thrill: The High Sensation Seeking Highly Sensitive Person. 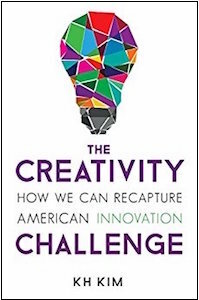 A new book explains how to recognize and encourage creativity in society—before it’s too late. Will and Diana Harper, the director and producer of Sensitive the Movie are making a new film about high sensitivity and relationships. They are currently looking for sensitive people to interview for the film who have been married (or in partnership) and the relationship didn’t work out due to a lack of understanding of the temperament between partners. They are also interested in interviewing people who are in relationship where the couple was able to work out the differences in temperament between partners. If you are interested in being interviewed in person, please contact Diana Harper, the film’s producer at: info@sensitivethemovie.com Please let her know where you live, your contact information, and briefly in a few sentences what you wish to share about your experience of an HSP in relationship with a non-HSP. The interviews will tentatively be scheduled for February 10th to February 22nd. “The creative mindset is one we know to be complex, fluid, and open. The creative instinct in sensitive sensation seekers may keep us in a state of potential emotional chaos at any given time, but it also serves to loosen our primitive inner structures that otherwise keep us from further personality development. The disintegrating/reintegrating processes so many sensitive sensation seekers experience doesn’t mean we are unbalanced emotionally it means that we may live in a state of positive disintegration in service to our quest for a personality ideal. Positive disintegration, in this sense, is a theory that places value on the sort of complex, messy, uncertain emotional lives we sensitive sensation seekers experience, rather than viewing this swirling inner milieu as a pathology. That places the theory of positive disintegration on a par with no other theory of personality development” (Tracy Cooper, 2016).